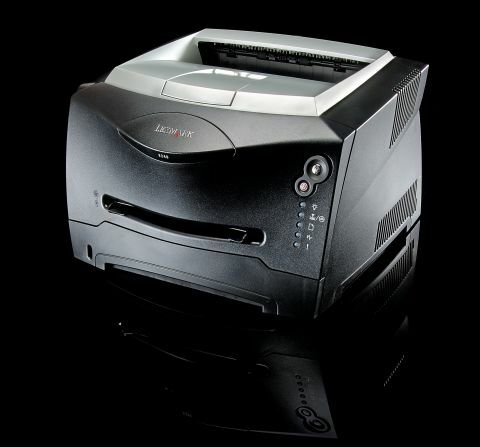 Lexmark is a solid brand for monochrome laser printers, and this model looks like it's been built for warfare. That feel continues throughout the machine, with great engineering and performance. The E240 is a smaller, budget version of Lexmark's E340, which is one of our top choices as far as mono lasers are concerned. The major differences are to the interface, as the E240 doesn't have an LCD panel. A more minor cutback has also been a reduction in memory size. The E240 comes with 16MB of expandable memory (up to 80MB). The processor is 366MHz, which is an excellent speed at this price point and the same spec as the E340. Aside from those minor points, we found many of the same qualities of the E340 in the cheaper E240, too. The build is as solid, the prints are as fast and clear, and it uses the same consumables. The overall price including associated running costs is enough to give HP, strong in sub-£200 monochrome lasers, a run for its money. The E240 uses the same toner as the E340. A replacement will give you 2,500 pages and costs £50 from Lexmark. That works out at around 2p per page, or less if you go for the higher yield units. We wonder whether Lexmark will replace the E340 with the E240, because it's hard to justify spending an extra £70 once you've seen the E240. Software installation is straightforward. From doubleclicking Lexmark's Mac driver and following the instructions, through to finalising the installation took about 30 seconds. The printer then automatically appeared in all applications as a printer option. From cold, the E240 took a couple of seconds to warm up, and then the first sheet we printed (a typed document) was out in 8.4 seconds - about a second slower than the E340. We printed batches of six-sheet print runs of the same typed page and found an average of 19.2 seconds per batch, which is only about a second slower than the printer's bigger brother in a comparative test. The results were crisp and clear. When we printed out imagery, the shades of grey were a bit difficult to distinguish, which is a problem with the E340, too. Lexmark says that this printer has the same print quality as the E340, and we found no reason to doubt that. Laser printers are the best option for small work groups. The print speed, running costs and life expectancy are all tried and tested, and at this price range consumers can buy with reasonable confidence.